Himachal Pradesh State government has taken a progressive initiative to encourage students from the tribal community across the state. 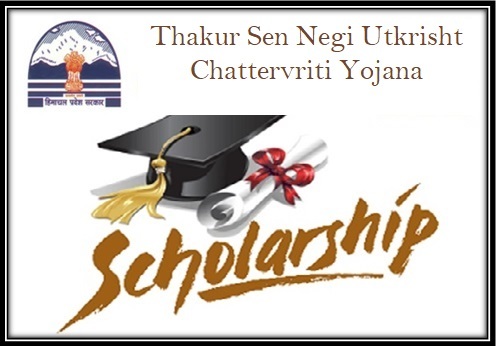 Thakur Sen Negi Utkrisht Chattervriti Yojana has been announced recently under which the toppers in schools and colleges will get annual scholarships. With this scheme students who are unable to continue studies even after being meritorious will get opportunity to continue study in higher standard. The main objective of the scheme is to encourage education for the people belonging to tribal community. Both boys and girls will get immense opportunity to pursuit their education under the scheme. Under this Thakur Sen Negi scheme, 100 girl students and 100 boy students will get scholarship for higher studies. Selection of the students will be based on their merits. Only top 100 students will be eligible for the scheme. Selected students will get Rs. 11, 000/- annually to support their cost of education. Also it can be renewed if the student performs well in his / her 10+1 or 1st year final exams. Based on their result the scholarship can be renewed for next year. There is no offline mode of application. Application forms are available only online in the official website. Any other offline form will not be acceptable under this scheme. Domicile: The students or applicants must be the domicile of Himachal Pradesh. That is they must be the permanent residents of Himachal Pradesh. Category: As mentioned that the scheme Thakur Sen Negi is specially launched for the students belonging to tribal community, hence the applicant must belong to scheduled tribe category to avail the benefits under the scheme. Qualification: The applicants who are appearing for the matric (or 10th standard) or passed out the same will be eligible for the scheme. Also students who are preparing for the technical and special education can avail the scheme as well. Boards: Students who are applying for the scheme must be passed out from the Himachal Pradesh Board of School Education. No other boards or organisation will be considered under this scheme. Aadhaar card or Unique Identity Number mentioned in the aadhaar card of the applicant. Residential certificate of the applicant that shows the applicant is a permanent citizen or domicile of Himachal Pradesh. Category certificate of ST caste certificate to verify that applicant is belonging to the tribal community. Mark sheets / result cards of the applicants from the previous class / years. Mark sheets should be valid and from a recognised institution under Himachal Pradesh Board of School Education. Bank account details of the applicant should be submitted too. If the applicant is minor, then there must be a minor account of the applicant with the bank. The scholarship amount will be credited to the applicants’ bank account only. Passport size photographs of the applicants. Application for the scheme will be done through online only. No offline application process is available under this scheme. Step 1: For online application visit the official page http://hpepass.cgg.gov.in/NewHomePage.do. In the home page, the candidates will get the tab ‘Student Login’ in the main menu bar. Applicant needs to click on the tab. Step 2: If the applicant is a new student then he / she can click on the ‘Register’ button and proceed with the registration process. After successfully registration with the website the applicant has to login with the ID and password. Step 3: After logging in to the website find the tab ‘Apply online’, clicking on the tab will redirect to the online form page. Before filling up the form one must read the guidelines of the forms. Step 4: Fill up the form with mandatory and correct information such as name, address, contact details, category / caste details, family income, bank details, previous year / class marks and results and so on. Step 5: Submit the form online and take out the print of the submitted form. The print out of the form must be submitted to the head / dean of the institution applicant is willing to study or currently studying. The above mentioned documents will also need to be submitted along with the print of the application form. After the submission of the printed form copy, the head of the institution will verify the information with the online information given. Afterwards the forms along with verified students’ list will be forwarded by the school head to the DDHE and Directorate for the technical studies. Second round of online verification and checking will be done by the DDHE for the school students and Directorate for the technical students. Further the forms will be sent to the schools again for records. Also the DDHE sent the hard copies of the selected forms to the Directorate for future reference. The hard copies of the same must be sent to the schools by the applicants within first 7 days of October. The scheme has already started registration process and soon it will start implementing for the betterment of the students from tribal communities.